Generative drawing by Leonardo Solaas. Texture is much more than physical composition or structure (it is that too). Populations, countries, communities, art, music, ideas, thoughts...are textural as well. Moving, shifting and never static. ‘Ethereal Rhapsody’ necklace by Reena Ahluwalia. Inspiration for ‘Ethereal Rhapsody’ came from the Pleiades star clusters also know as Seven Sisters in the Greek mythology. 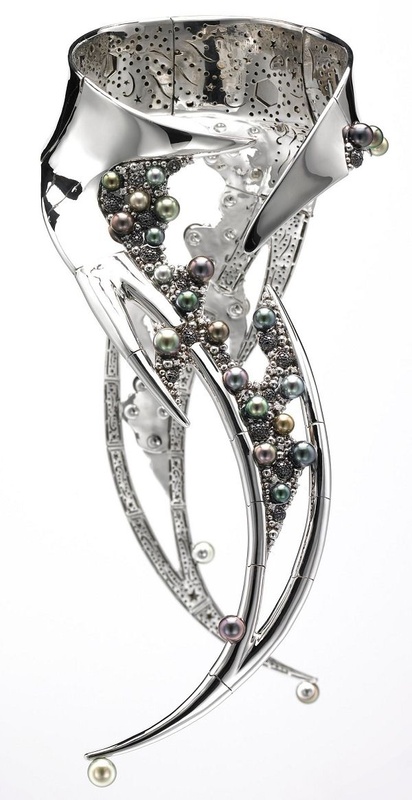 Tahitian pearls, black diamonds, white diamonds, 18 K white gold. Winner of Tahitian Pearl Trophy.